Elegant Labella - Add a touch of Provincial charm to your bedroom with the luxurious period style LaBella - ANGELLA Dressing Table and Stool Set. Graceful and elegant, this Set exudes finesse in every corner and aspect. Much like yourself as you prepare for the day in alluring beauty. 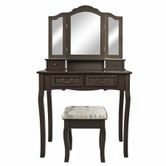 This Provincial Dressing Table and Stool Set is a perfect complement to your refined taste in home decor. If you are looking to add some sparkle to your bedroom, these mirrored dressing tables are sure to please. Only the finest quality Silver mirror is used on these mirrored dressing tables and dressers. All of the Silver Mirror with clear and perfect reflection! All of these mirror dressing tables are individually quality checked before they leave the factory.